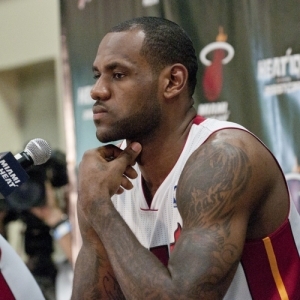 Seriously, do I even need to write much in the way of previewing the 2010-11 Miami Heat? This is only the most-hyped team since Michael Jordan’s Bulls, with some even expecting the Heat to break Chicago’s record of 72 regular-season wins. Former coach and current NBA analyst Jeff Van Gundy has said he thinks the Heat will get the record, but most experts believe the NBA is simply too deep and that the Heat will have too much of a bull’s-eye to even reach 70 victories. Obviously, it’s possible that LeBron James, Dwyane Wade and Chris Bosh make up the best trio of players on one team in NBA history. Apparently not since the 1975 Boston Celtics has there been a team that placed three players on the All-NBA first or second teams – it’s almost a lock that LeBron and Wade make one of those, so I guess it’s up to Bosh. It’s possible that the Heat could actually start a bit slowly because the Big 3 might only play three minutes together in the preseason with Wade suffering a hamstring injury in the preseason opener and he hasn’t yet returned. The main question here is if Pat Riley can stop himself from returning to the bench; he has said he’s not going to coach but you have to know the allure is there if for some reason Erik Spoelstra is overwhelmed by all this. Well, you obviously know about the Big 3. Miami let guys like Quentin Richardson, Jermaine O’Neal and Dorell Wright go while trading Daequan Cook and Michael Beasley. No big losses there. But what was amazing was how the Heat were able to lure veterans like Mike Miller, Zydrunas Ilgauaskas and Eddie House for pennies on the dollar with the chance to win a ring. The Heat also were able to keep Udonis Haslem and signed Joel Anthony, and he will be their starting center. Needless to say, center would therefore be the main question mark then on this team, although Anthony will simply be asked to bang down low and block a few shots. But it seems possible that teams with a big frontcourt – L.A. Lakers, Boston, Orlando, maybe Chicago when Carlos Boozer is healthy – could give Miami some trouble, although the Heat also added 12 potential fouls (that’s directed at you, Dwight Howard) in guys like Juwan Howard and Jamaal Magliore. Mario Chalmers will round out the starting five as the point guard, but in reality that’s what LeBron will be. Miami’s ‘over/under’ for regular-season wins is 64.5. The Heat’s odds to reach the East Finals is -400, -175 to win the East and +170 to win the NBA title. Heat vs. Lakers is the +140 favorite to be the NBA Finals matchup. Heat vs. Magic is the +225 favorite to be the East Finals. LeBron is +350 to win the NBA MVP award again while Wade is +800 and Bosh +3500. All odds are courtesy of BetUS. I’m actually in the camp that thinks Miami won’t be as dominant as everyone expects. I think it will take some time for this group to gel. Still, I would expect them to be able to exceed 64.5 wins by a couple – shoot, the Cavaliers did that two season ago with a lot less talent around James. I don’t think LeBron wins the MVP because there are literally so many negative feelings about him around the league. Plus, his scoring average will suffer this year, while his assists certainly should go up. The Heat will win the NBA title, but that will come in Year 2 of the Great Experiment – they lose to the Lakers this season (assuming Andrew Bynum gets/stays healthy).